Recent updates in hardy-proposed (now pushed out to updates) causes a significant cpu spike when using gnome-appearance-properties to change desktop backgrounds. Selecting the background wallpaper by using a mouse is very slow and responsive, however using the keyboard arrows is more responsive. 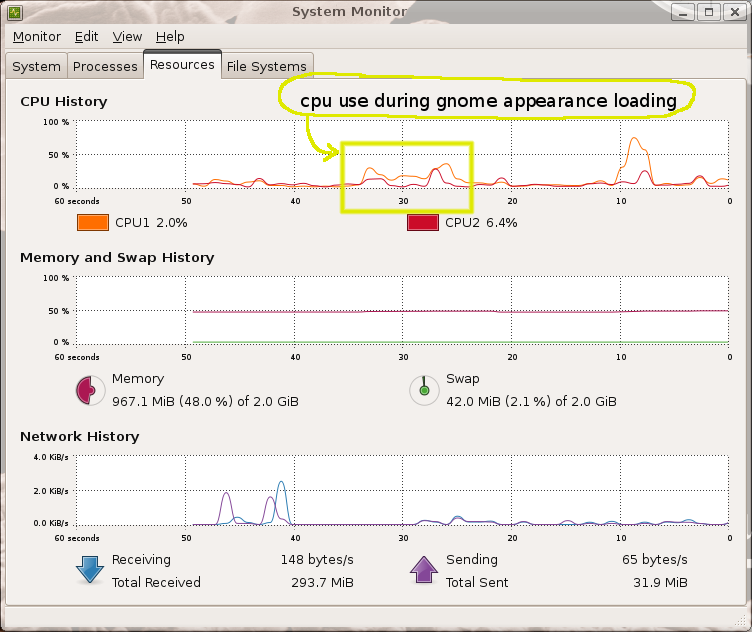 gnome-appearance-properties also takes up much of the CPU during this process. There were recent changes in nautilus and gnome-desktop that fix issues with backgrounds, but seem to have introduced a regression. It appears that now a fix for this is in -proposed. Confirming. Same bug here. Others are reporting this in ubuntu.it mailing list. The patch fixed it, but now I get 4 updates, the same I've just installed. Well, it actually looks that I've applied the patch to older packages... the updates are 2.22.2-0ubuntu2, while the patched are 2.22.2-0ubuntu1. I did "apt-get source gnome-desktop". Where did I go wrong? Sorry, but it's the first time ever I tried patching. it's a gnome-desktop bug not a nautilus one. rejecting this task. It's fixed with 2.22.2-0ubuntu3. You've been was very quick, thank you. Confirming lanzen comments, the bug is fixed with gnome-desktop 1:2.22.2-0ubuntu3 ; thanks. I'm using UbuntuStudio 8.04, updated with recent kernel (2.6.24-18-rt). Already tried installing the 2.22.2-0ubuntu3 version of the gnome-desktop-data package from -proposed. Conky reading shows that CPU still stays at 100% and I'm still unable to choose the wallpaper with mouseclick. Early AM June 4th update from Hardy Proposed fixed the bug! It Is fixed now after installing nautilus and nautilus-data package from hardy-proposed. I don't get updates from Hardy proposed yet I notice this bug today. Did it get released into normal updates, and if so, am I understanding correctly that now a fix is proposed? I also just noticed this bug. Everything worked fine 2 days ago when I changed my desktop wall paper. Now top reports gnome-appearanc using 96% cpu and I can't change wallpapers. I do not have hardy proposed enabled. I do have backports enabled, though. The fixed package is in the hardy-proposed repos. I would think that it would be placed into the main updates within a day or two. reading again the change description it seems that the description has just been reformated, does anybody still get the issue using the hardy-proposed version? The issue is resolved with the gnome-desktop update in hardy-proposed. Confirmed. Yes, I having the same problem. The CPU spike to 100%. The 2.22.2-0ubuntu3 version from hardy-proposed did NOT fix my problems at all. Hi Sebastien. I have edited the title to reflect my understanding of this bug. I *think* what happened is that the original problem appeared in hardy-proposed and this bug was filed. Regardless of this bug the -proposed was pushed to updates, and as such people are commenting about having the issue without -proposed (I can confirm I have this issue without -proposed). THEN a fix for this issue was put in -proposed, so now proposed is fixed, while it is broken in an updated Hardy (reversed from initially when the bug was filed). Does that make sense? Can anyone confirm? > The 2.22.2-0ubuntu3 version from hardy-proposed did NOT fix my problems at all. Nope, that bug is not a problem for me. I am pretty sure that it is this issue i am suffering from. The description fits perfectly, and what Mike Rooney says makes sense to me. the issue is fixed for everybody else so you will have to investigate what is different on your configuration, do you have the bug using an another user configuration? does downgrading to the hardy version fixes the issue? Sebastien, could you clarify "fixed for everybody?" Do you mean everyone who has enabled -proposed and is updated in that respect? Because I do not use -proposed, and definitely DO have this bug on my end with normal updates. "I *think* what happened is that the original problem appeared in hardy-proposed and this bug was filed. Regardless of this bug the -proposed was pushed to updates, and as such people are commenting about having the issue without -proposed (I can confirm I have this issue without -proposed). THEN a fix for this issue was put in -proposed, so now proposed is fixed, while it is broken in an updated Hardy (reversed from initially when the bug was filed). Does that make sense? Can anyone confirm?" Confirmed. This is exactly my situation. I have never had -proposed enabled, only -backports. The problem still exists for me. I have not tried to enable -proposed in an effort to fix it. Guys, the -proposed are proposed updates, if they work, they go as official updates in -updates. If you choose to add proposed in your repos you can choose to update only the gnome desktop related files, log out and log in again, and you'll see that it's fixed. You don't have to update everything. On the other hand, you can be a bit patient and wait for the fix to be officially released in -updates, then try it out. I had the same problem and i couldn't set the wallpapers even with keyboard. The wallpaper changes. I can see the new wallpaper at startup. But after startup, only background is visible. No wallpaper. I updated gnome-desktop-data and libgnome-desktop-2. Now I can select wallpaper with mouse. But has no effect. I had the same problem and i installed gnome-desktop-data 1:2.22.2-0ubuntu3. There is no cpu spike now. But cannot set wallpaper; neither by clicking nor arrow keys. I updated to 1:2.22.2-0ubuntu3 but still notice the high CPU/lag issue, particularly when using the mouse to select. > I updated to 1:2.22.2-0ubuntu3 but still notice the high CPU/lag issue, particularly when using the mouse to select. does downgrading to the hardy version fix the issue? > does downgrading to the hardy version fix the issue? I noticed the issue in the standard hardy version in the first place which prompted me to try the version in -proposed, but both act in the same CPU intensive and sluggish manner, especially when using the mouse. This problem happens on my Thinkpad R61 too. I'm using Ubuntu Hardy fully updated. did you all log out and log back in? there is no cpu/memory spike. I can change desktop background color. But wallpaper is not showing. Please apply the fix to Intrepid ASAP. I have updated to the latest Gnome-Desktop-Data package as suggested above with no luck - CPU spike disappears after close however. What information is required from me to assist diagnosis? I have updated to the latest packages from Hardy Updates and the bug is resolved on my system. It worked without logging off and back on. I also tried logging off and on and the bug remains resolved. Mouse changes wallpapers as expected. Thank You. Since there has been a lot of discussion regarding the status of this, I just want to confirm that the latest fix downloaded earlier today fixed the issue on my end. I had some problems a few days ago with the gnome-desktop-data 1:2.22.2-0ubuntu3 from -proposed which didn't work. However, after todays system update the bug is fixed for me. I've applied all fixes and still experience the problem.